WoW Zone by Zone Achievement Guide Part 10: Azshara, Durotar and More! 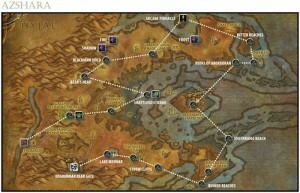 You are here: Home / WoW / Maps / WoW Zone by Zone Achievement Guide Part 10: Azshara, Durotar and More! Welcome to ZAGGARAT ( Jetsai’s Zone-by-Zone Achievement Guide for Getting Across the Realm with Alliance Toons), a comprehensive zone by zone guide to wrapping up every achievement you need. You can view all instalments by clicking here. The printer and screen friendly guides can be downloaded at the bottom of this post. Azshara is the coolest zone. The new Goblin areas like Galliwix Pleasure Place, Bilgewater Harbour and the twisting Rocketways that traverse the zone definitely make it the new Steampunk capital of WoW. With no Alliance quests until Stonetalon, Loremasters get a well-earned reprieve from one-shotting 12 things while collecting 8 other things to sit back and enjoy the rocket-ride. Robochick and Rabid Nut Varmint, two of the only six catchable mechanical pets, are both found here and Archmage Xylem’s Trials (how-to guide here) are three fast and fun achievements easily accessed through a central portal hub at the Arcane Pinnacle. Orgrimmar, however, will be the Bremer Traffic Wall to Azshara’s Bilgewater Rocketway for most. As the Stormwind of Horde, only the craftiest will complete this area without getting their cold dead corpse /hugged by a loving troll. There’s a secluded fishing spot marked on the map, away from town business and the daily questing areas for Old Crafty and The Fishing Diplomat, but catching a battle pet for Big City Brawler may not be as straightforward. The Orgrimmar Wind Riders are vigilant and relentless plus there’s a bug that means unless the banner above your mini-map says Orgrimmar, the catch probably won’t count. The entrance to Ragefire Chasm is underground down a long tunnel and is much easier to find if you know exactly where to look and unseating Garrosh Hellscream will require nothing short of a full raid. Completing Durotar and Stonetalon Mountains will lead you to the Nortern Barrens and the most tragic casualty of Cataclysm – Barren’s Chat. Previously a hot-bed of emotion, the mecca of trolldom and the birthplace of Chuck Norris’ WoW celebrity, Barren’s Chat has become little more than a few solitary alts trying desperately to incite the hey day of old and failing miserably. Tauren, orcs, and trolls were all pointed toward the Barrens after finishing their starting areas and this mass of population drew many of the Undead here as well. The combined zones thus became a vast questing nexus with very few flight points that spanned 20 or so levels of long, boring runs from objective to turn-in. One of the early quests, Lost in Battle, required you to find “Mankrik’s Wife who fell in battle”. The quest didn’t mention that Mankrik’s Wife was actually called “Beaten Corpse” and gave almost no directions to her location. As a result almost everyone resorted to asking where she was in general chat. Twenty levels of hearing the same question repeated over and over and over again to a mob already agitated by boredom would drive anyone insane and Barren’s Chat was born… Where’s Mankrik’s Wife? In my bedroom… In Chuck Norris’ bedroom… No, you’re mother’s in Chuck Norris’ bedroom… Ur a loser… How much wood would Chuck Norris chuck if Chuck Norris could chuck wood?… all of it… ALL OF IT!